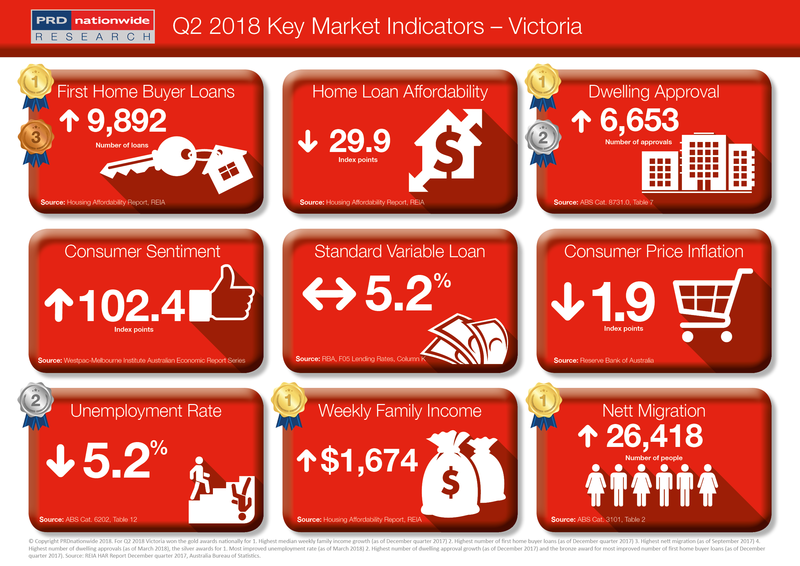 It was a clean sweep for Victoria, taking out 4 gold awards nationally, 2 silver and 1 bronze in the PRDnationwide Q2 2018 Key Market Indicator Awards. Property prices in Melbourne have increased exponentially over the past 12 months, as investment interests shifted from Sydney’s unaffordable landscape. It is no surprise that VIC’s home loan affordability index has decreased by -0.7% over the past 12 months to the December quarter of 2017, which is in contrast to Australia’s positive growth of 0.3%. VIC’s home loan affordability was 29.9 index points in the December quarter of 2017, which is still slightly higher than NSW’s 26.5 index points. VIC achieved the gold award nationally for the highest median weekly family income growth (as of the December quarter of 2017), recording an increase of 2.8%. This is timely considering the state’s home loan affordability patterns. VIC has also earned the gold award nationally for highest number of dwelling approvals (as of March 2018), recording 6,653 approvals. This represents a 22.7% growth over the past 12 months, which when compared to nett migration growth of 5.4% over the past 12 months to September 2017 may signal an oversupply in the near future. All these factors, combined with the first home buyer grant and stamp duty policies set by the state government, potentially explain why despite a decline in home loan affordability index growth VIC attained the gold award nationally for highest number of first home buyer loans category (as of the December quarter of 2017), recording 9,892 loans. Furthermore, VIC took out the silver award nationally for most improved unemployment rate (as of March 2018), declining by -16.1% to record an unemployment rate of 5.2%. This is lower than the Australian average of 5.5%.